This is the Area that surrounds the mountain of the divines. Clan wolves generally gather here if the divines wish to announce something, or if they just wish to have some time out to spend a little time in the paradise of the world. This place is very popular for the divines to take some time out too. Kamea looked down at the beautiful land below, however this time she didn't pause to admire it. Glancing back she checked to see if anyone was following her. For now it was only Karatavuk. Her flame touched ears flicked hearing the pup's questions. We are going somewhere safer, Marco, she told him through her thoughts, her mouth currently full of pup, There might be something out there but there is no need for you to worry. Spotting down below the thick area of trees in the valley of the Margin, Kamea swooped down and landed. Trotting into the cover of the trees she placed Marco down. "We should be safe in here..." she said, perhaps more for her own benefit than the pups. The river had morphed into rocky-bottomed streams as Erasmus neared the Margins. He soon found himself wading in waters up to his shoulders rather than swimming along the bottom. The trees had grown much thicker as he traveled and now cast shadows across the surface of the tributary. Gradually, the water grew more shallow until he was merely walking on moss-covered stones. Erasmus then turned toward the forest, not bothering to shake out his pelt. As he lumbered along, his tail left a moist trail of river water on the leaf litter. His keen nose quickly scented Kamea and one of the new pups in the woods. The Fluidus continued his easy walk until the pair were visible to his blue eyes. He gave a gruff snort to announce his presence before he approached. Erasmus glanced at the young one for a moment before looking curiously to the Divine. He was hesitant to ask anything out of fear of frightening the pup. The way grew shallow and cool as she swam, and eventually she could no longer dive as she had before. With the river fast returning to the streams of its origins, like a book being read in reverse, Dobharchu could not longer swim, but rather had to walk along the stony bed. As her feet scrabbled against the rocks, she noted the pain had dulled significantly, as though her feet suffered as much from being too dry as they had from so much travel. Even the webbing between her toes seemed revitalized. In her climb she thought that it had been torn away, leaving her with the feet of any other wolf who walked the land rather than swam through the rivers and marshes. She coughed and spat to clear her lungs of water so that she might breathe air again, and she filled her nose with the new scents of this place. The margins, as she believed herself to have reached, was a place where few wolves tread. Only the hints of stronger scents were detectable from her position. Giving only the slightest shake to her heavy pelt, she felt the growth of the symbiotic plantlife in her fur again. This too, she feared she had lost in her travels. Like the savannah after the rains come, the difference between her appearance then and now was alarming in part due to this change. Again alive rather than dormant and small, she had a heavier appearance to her than she had before, although under the growing things she remained rail thin. The spines of the plants intermingled with the fur of her long tail making it heavy so that it nearly dragged behind, but for her conscious effort to keep it off the ground. Head low, she reached the shore of the stream, and paced it slowly. Again she found the male's scent, and soon his dripping trail as well. With careful steps and increased caution, she followed him once more. While her impertinence had been tolerated in that dangerous plain, there was no guarantee that such would occur again. After tracking him for only a brief time, she came to a place where wolves once more gathered. Another winged wolf, female by build and scent, stood with a cub at her feet. With them the wolf she'd followed to this place. While the female cooed soothing words to the cub, the male said nothing, but remained as stoic as he had been when they first parted ways. Head still down, she made mind to reverently lower her ears to her skull. This winged one was a different one than the creature that had invited her to this place, so her reaction to a stranger could be drastically different. Upon entering the presence of the three, she nodded, and, spoke softly. "My lady and kind lord," She began, stopping a distance from her, close enough to be heard while speaking soft tones, but out of the range of a bite or a strike with those powerful wings. "I have offered whatever aid I can give to your kin, and extend my good will to you. I am a stranger here, but I mean no ill. I ask safe conduct while in this place." The auric female managed to ride the low air currents with minimal effort as she carried the pup towards the Margines, practiced waves of calmness washing off her and over Aphrodite to soothe the pup's anxiety. She refrained from her usual acrobatics, keeping a steady and smooth pace while the land beneath them seemed to burst into a green expanse of life, dotted by vibrantly coloured flowers and broken only by the stream that coiled through its center. Like her sister, Misae made no time to pause and inspect the beauty of her surroundings as she would have liked, instead heading towards the cluster of tightly grown trees where she had caught a glimpse of others entering. Angling her body downwards, she began a slow descent towards the others so as to keep the pup relaxed, not halting the calming air around her nor loosening her grip. Extending her forelegs, first one, then two golden paws touched the earth to allow her to land with a grace common to all of royal blood, her wings folding in neatly to her sides as she came to stand on the lush grass of the Margins. 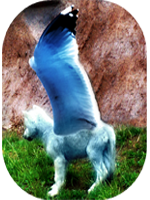 She lowered the pup gently to the ground, extending her aura of calm to ensure Aphrodite would not be frightened. With a small nudge she coaxed her to follow before stepping into the trees herself, sapphire gaze passing from Kamea and the fire pup to Erasmus and the wolf that had greeted her on the plains and who now looked considerabley cleaner. She offered all a warm smile and a small wave of her tail as she came to sit not far from Kamea. She had heard the new wolf's words upon entering the small copse of trees and sensed the water wolf's feeling of hesitation yet honesty. Even though she knew her sister could read the wolf's mind and pick out any thoughts that may contain malignant intention, she still thought to both herself and the other Divine; she speaks with honesty and emits a certain sincerity. I don't think she wishes to cause any harm. With that in mind, she allowed the feeling of calm friendliness to affect not only Aphrodite, but all others surrounding her with a soft omnipresent sensation. "You are granted shelter and safety here within our lands as long as you keep true to your word." Misae spoke with a voice that sounded as though it were woven from light, "We here are known as the Order of Hope and we act as a training post and sanctuary for all wolves whom find themselves part of one of the four clans. I am Misae, may we be permitted the knowledge of your name?" Such formalities were one of the few things the golden wolf did not have to learn upon entering the Order, thanks to her upbringing, and though she had lost much of the regality with which she used to speak, she still knew how to welcome a wolf properly. We are going somewhere safer, Marco. There might be something out there but there is no need for you to worry. The thoughts rang through the young pups ears, and out of instict, he pawed at them nervously. Great, i'm going crazy... Marco thought to himself with exaggeration. But with a glance into the flame-eared wolf's eyes, he had the crazy idea that she had told him, but he immediately shook the thought from his concious. Landing strangely on his paws, the small brute stumbled as the ground returned to him, but he quickly straightened up in fear of making a fool of himself. "We should be safe in here..."
The pup remained still for a moment as she mused, and soon he interveined. "Alright..." he nodded, glad he could hear her out loud instead of in his tired mind. "But please, m-ma'am, don't leave me alone. I'm lost." These words were hard to admit, but he did so with a blush anyways. His attention was soon guided to not only the watery-black adult, but also a companion he had brought along. Marco wasn't fond of one of these wolves, let alone two. The most unfamiliar of the two spoke to his transporter for a moment, but he paid no attention to the words exchanged. Lost in thought momentarily, marco was brought back to attention by the blinding glow of the golden wolf he had seen earlier, along with another pup in her maw. More converssation was exchanged, and marco's eyelids were slowly dropping. Marco was still exhausted, and his brief nap on the rock had not been satisfying enough. Out of pure risk, the young pup slumped down to his stomach, landing lightly on the older wolf's (Kamea's) paws. He knew it probably wasn't safe to trust someone with such strange mutations so quickly, but he liked her the best out of the small group by the stream. The babling of the creek lulled him into sleep, but he resisted shutting his eyes at all costs, for Marco knew something was terribly wrong, despite the adults (Kamea's) reassurances. In that moment, a sudden sneeze escaped from Marco. Again a small spark flew from his mouth, but this time it was larger, about the size of a claw. He was to tired to realize that he probably should be afraid or embarrased, but his neck started hurting suddenly, a burning sensation rising up in it. Ouch! he thought, coughing slightly. The coughs soon rumbled a bit deeper in his chest, until they ceased, the burning still evident but less painful in his throat. He didn't complain, and to cover up for the little mishap, Marco flung his paw over the still burning spark, putting it out almost immediately. For any other wolf in the small clearing, even this small contact with the flick of flames would be mildly painful, but Marco liked it. It was comforting and warm, sending pleasurable sensations up his arm and to his spine, causing him to shiver in delight. Stifling a laugh, the pup looked up at Kamea, a new light in his eyes. The wolfess took another cautious step forward. She did feel some of the calming aura, but it felt supernatural, as though from outside herself. She remained somewhat on guard, but open minded to trusting them. "My name I give freely." She replied. "I am Dobharchu, if it pleases my lady." She continued, "I thank you for your kindness, Misae." As she spoke, she studied the two cubs at the feet of the winged ones. Innocents, ones who were not ready for the coming shadows. The two were not kin to one another, nor did she believe they belonged to their female guardians. Two orphans, with perhaps others. One seemed to be developing abilities of his own, judging from the careless spark emited as he dozed. The other would as well, she assumed, although there was little indication to her eyes what those abilities would be. The realization that should very well be around to see their growth struck her, and it was a pleasant thought. However, while she would do her best to serve the needs of all the wolves of this place, her focus was on her service to the Deep, and to the further understanding of the secrets of the water way. It seemed that there was a rather large obstacle for the fiery wolf to wade through as she maneuvered after the others. A reluctant groan slipped from her as she eyed the body of moving liquid. Her ruby eyes narrowed in frustration; how could she get passed without having to submerge herself? She could not. If her flames went out, then she might as well kiss her life good bye. Others waded through it with ease, not a care in the world about whether or not they got wet. Slowly, she stepped to the bank and peered into the crystalline fluid. If Erasmus was waling through without trouble, then it might come to her belly. That was too far for her to care. Maybe I can be like one of those lizards that runs across the surface she thought. "Maybe I could!" she muttered, backing up until she thought that she had enough of a running start. If all else failed, she could dry the stream up, but then the others might be cross with her. As she stared at the now-distant body ahead of her, she began to doubt herself. Blaze had always seen the lizards fall into the water at some point. A frown crossed her muzzle. What else could she do? Asking for help was out of the question. Psst ... the rocks! hinted some part of instinct within her. "Like stepping stone," she realized in a little flare of bliss. Happily, the Ignisi female trotted to the area where stones peaked through over the top of the waters. Slowly, she began maneuvering over them. Their surfaces were wet and slippery. More than once, her balance shifted suddenly and she nearly fell, but as she continued, she only hoped that no one tried to communicate with her in a sudden manner. The last thing she wanted was to fall into the waters and lose her fire. Wait Blaze paused. She was not even sure if the flames would go out if wet. That had never really come up. Not wanting to risk it, she continued with care. Either way, she did not care to get wet. The little fae, scared to death, finally felt her large paws touch the earth and it welcomed her. Flowers and grass swayed a little towards her. She smiled, not noticing the strange happenings. She was calm and the golden wolf, as she knew her by Misae, was smiling too. The little fae spotted another pup. Someone she could talk too. Aphrodite approached silently, hidden within the tall grass with the stream gurgling a bubbling along to hide her noises. She stopped and sat up smiling. "Hello there, my name is Aphrodite, what's yours?" A little spark came flying and she stood up and started a little growl in her throat. Fire....dangerous. It rages and burns, though supplying warmth and new life, it rages without control. The white pup felt her eyes changing to an earthly green, something she does when she's scared. The pup quickly smashed the spark and looked around. He smiled a I could see a laugh coming, though it did not enter into the world. Rodite slowly sat back down comfortably. Marco flinched a little as the other pup came to his side and suddenly smashed the rest of the spark into the earth. "Hello there, my name is Aphrodite, what's yours?" The young pup was still in shock from her sudden reaction to his warm creation,and yet he was glad to see a face that could relate, even if on a tiny scale. Presenting a small smile, he looked up at her and pushed himself back onto his haunches. "Uh... hi, Aphrodite. I'm Marco." his plume swayed in a friendly fashion as he spoke to the young fae. Kamea looked down at the pup at her paw. "I won't leave you." Not alone anyway. The appearence of Erasmas almost caused the grey female to jump out of her skin. Mentally she scolded herself for so easily being frightened but her lack of being able to sense others like she usually could made her feel like they were coming out of thin air. Her attention was quickly drawn to another Pisces that she did not know. Luckily Misea was soon there, bringing Aphrodite with her and took over the introduction with the female Pisces. Feeling something against her paws, Kamea looked down to see Marco curling up against her. Her ears flicked nervously, which was quickly covered up by a confident look. The small pups coughs brought up a spark. A little fire... Looks like Blaze will not be alone for much longer... She gave Marco a smile as he looked up at her. The other little pup's violent reaction to the small spark surprised the Charmed one. She had looked scared at only the tiny little spark. It was hardly large enough to see let alone cause any damage. Her ears carried more heat than it had. Sitting down, Kamea spotted Blaze carefully making her way across the river, being careful not to get wet. Resting her head on her paws, the grey female focused on sensing the others' thoughts. It irked her to find that she could barely discern that Blaze was nearby and that her powers seemed weak. She gave a silent whine not sure how the creatures headed their way could do such a thing. "Uh... hi, Aphrodite. I'm Marco." Aphrodite noticed he had a warm look in his eyes. She smiled and nodded. "You look like you're going to be Ignisi Lupus." Aphrodite said, confirming her thoughts. "You are also about the same height as me, yet you are older?" She was confused for a second and her eyes shifted to a light baby blue. As they landed, at long last, and Aeria was set down she gave a breath of contentment. While she liked flying, she would have much preferred it on her own wings, not in the mouth of another. She immediately looked to the other wolf pups nearby, but frowned. She was not feeling too outgoing today, and in addition.. She'd rather be near the adult wolves. But before she decided to look to them, she felt something was awkward. Like something was sticking out of her back. She looked, and was pleased to find two bumps that she could move slightly. They were both shaped as Z's, with the first edge facing towards her rump, and the next point to her shoulder, and the last to her rump again. Proudly, she lightly flexed them to find them comfortable and easy to move, but of course they were only stubs with a couple down feathers. But they were there, and it pleased her greatly to see them. Upon seeing the troubled grey female, whom was a Divine as well, she plodded over to her curiously. Like she had done with Erasmus, she felt sympathetic to the stress the female seemed to have. Folding the numbs of her wings, almost smiling with delight as she was reminded they were there, she made her way to her. She'd not really gotten to give a proper hello yet. She looked at the female's wings, they were nice. She quite liked wings. "Hi." The young pup said simply, coming closer and closer to the female, when she also saw Erasmus come nearer. She smiled, and continued to the divine grey female, until she came to a stop before one of her paws, which were considerably bigger than hers. She had nicely sized ones, but already she was thinner, more streamlined than the other pups that messed around nearby her. She then gave a sympathetic poke with her muzzle, her turquoise eyes moving up in an attempt to meet the other females'. Marco only faintly noted Aphrodite's glance toward the grey divine's flame licked ears. Does she want them as much as I do? he wondered to himself, but before he could say anything, the fae pup was talking. "You look like you're going to be Ignisi Lupus." Marco only furrowed his brow, for he did not know what she was talking about. This was all so weird, so new. "You are also about the same height as me, yet you are older?" She questioned again. Nodding, Marco replied a tad bit louder than his previous volume. "I guess. I don't know how old you are," he admited, "but i'm seven months." This almost made him grin. He felt older than he actually was, and took a bit of small pride with being his current age, even though he knew it was foolish. Marco looked into her light azure eyes, but could've sworn they were grey just a moment ago. he shook it off and looked away, training his eyes on the orange fire wolf leaping carefully on stones across the stream. "How do you know so much? I feel like I know nothing here," Marco asked Aphrodite calmly, still watching the fire wolf. Clearing the stones, Blaze grinned to herself. There were droplets hanging from the tips of her fur, but she was not wet. Sure, there had been splashes that had misted over her back, but the fiery female had managed to keep the flames in tact. Odd how she had been this way for so long and could not ever recall a time in which her flames had come in contact with water. Shrugging, she looked at Kamea. The poor girl looked as though she had been hit with a brick. I wonder what happened she thought. But, before she was able to ask, she felt eyes on her. With a frown, she looked at the small male that had arrived not long before they had been forced to move to get away from whatever threat had terrified Kamea so much. Now that she was on the grass, Blaze sat and began licking the droplets of water from her fur. As much as she tried to hide it, the looming feeling of doom was not fading. Every few seconds, her ruby eyes flashed to the sky to see if there was anything there, but as of yet, there was nothing. Then, she overheard yet another pup speak. This one she did not recognize, either. But, the term "Ignisi Wolf" came from her. How does she know so much? Blaze wondered, eyeing the female with suspicion. Rolling her eyes, Blaze stood and sauntered over to the pair. In order to start a scare in the little ones, she urged the flames that crackled at the top of her ears and the ones that licked at her legs to burn in a more vibrant nature. With a smirk, she peered down at them. "Why, hello there little ones," she growled hauntingly. "How do you know so much? I feel like I know nothing here,"
Rodite cocked her head, she didn't know where she had all this knowledge. It just came to her. "I'm not really sure, Marco, it just comes to me. was know entirely too confused to even think in the right direction. Then a growl erupted from a fiery female. [color=red]"Why, hello there little ones,"
The large pup saw the flames and her eyes turned to green, earthly green. Aphrodite's lips began to curl up in a defense, but she knew better than to attack an adult of the Order. "Hello there, I'm Aphrodite. And you are?" Marco's eyes were still lingering on the firey female as she gave the two pups a cold stare. He couldn't help but return a little, giving a less frightening, though just as intense, glare right back. Although he did drop his gaze as she began to aproach. He waited for her to travel over, not speaking, just studying the way her almost leg lengthed flames grew brighter as she strode near. He was still looking when his almost-companion Aphrodite introduced herself. Marco drew his eyes up to look at the burning wolf to look into her optics, but he ended up looking at her ears instead. Oh, how he longed for fire. Before she could respond, the young brute cut in as well. "Marco," he stated simply. He easily felt comfortable, despite the closeness of her fire. Looking over at Aphrodite, to see her expression, Marco realized her eyes had changed again. He settled for just thinking it was a simple thing she did and awaited the older females reply. "My lady and kind lord, I have offered whatever aid I can give to your kin, and extend my good will to you. I am a stranger here, but I mean no ill. I ask safe conduct while in this place. My name I give freely. I am Dobharchu." Erasmus was pleased to see the other Pisces restored to health by the water, though he remained expressionless as usual. Her way of speaking and her conduct thus far baffled the water wolf. Years of brooding had made him callous and unwilling to trust. As a result, the kindness she displayed to perfect strangers seemed incredibly strange to him. Once again, he did not question, yet decided to introduce himself as well. "I am Erasmus," he stated simply, "leader of the Fluidus clan." His voice was low and rumbling, much like the rapids of the deep canyon nearby. He would not divulge any more unless asked to. The water wolf watched as the others trickled into the area, paying more attention to the young Aure with the periwinkle fur. Aeria's wings were beginning to take shape. The pup was obviously pleased by this as she tested them out before folding the downy nubs neatly along her sides. She, too, perplexed him. Like Dobharchu, she had shown kindness to a perfect stranger. Her earlier words echoed throughout his head. "I like it when you smile. It's nice when you look happy." Now, as he observed the young one doing the same for Kamea, he felt the muscles of his face flexing into the smallest of smiles. It was a start. Audric sat apart from the group, not far, but enough that he had some space. He sat with his eyes closed as he listened around him. The air and wildlife was quiet, which he couldn't tell was a good or bad sign. When he opened his eyes, he saw nothing but the pups and the others. Standing he stretched and walked closer to the group, unsure of who to socialize with, he needed a break from trying to figure out what the trees weren't telling him. But i seemed that everyone was bent one being quiet. Blinking his eyes closed and then open several times the male tried to adjust to being "deaf". The grey female noticed the young air pup coming toward her. The pup even giving her a poke. "Hello Aeria," Kamea muttered. "Looks like you'll have a nice set of wings. Might take you some time to learn how to fly once you get them." She looked over the young wolves. Each of the clans were growing. Looking at the clan leaders she was somewhat pleased to know that they won't be so alone in their lands. Blaze however she wasn't so sure if it was such a good thing. They way she came over and growled at the pups was not very welcoming. Kamea gave the ignis a stern look. Erasmas was far more welcoming to the young ones. Audric would possibly be happy to have company too but Kamea noticed that something was up with the male. Perhaps the strange loss of strength in her power was not only related to her. Giving a small smile to Aeria in front of her, the Charmed one stood. "Is anyone else noticing differences in what their usual abilities entail?" When he introduced himself, Dobharchu nodded, but said nothing more. She'd followed him here, and would perhaps follow him again, not as a stanger, but as a wolf of the Order. However, she contemplated the nature of the female's words. Misae offered shelter and safety, and nothing more. These lands were for training wolves of the order, such as these cubs before her. In studying them, she saw that they did indeed have much to learn. "Once upon the wind were a gathering of seeds, each whispering to one another their hopes and fears for what they would grow into. One said to her kin, 'I hope to grow to be beautiful, and when the fire comes it will leave me because of my loveliness.' The other seeds agreed, save one. 'I will not fear the fire, because I will be stronger than it.' The other seeds called this one a fool. "The seeds came to land in the soil and took root. Many became grasses and flowers, because they decided to play in the fields together and dress beautifully in gold and green, and when the winds came they danced merrily. Their roots were shallow, but their hearts were merry. "The lone seed, called foolish by her companions, hurried into the forest, and took root in the loamy soil. She buried her roots deep to drink hearily of the waters below, and dressed herself in armor before the finery of her friends. When the winds came, she did not dance, but practiced being strong. She grew to be a great tree. "Fire came swiftly one day upon the fields, and the grasses quivered and cried out as they were swiftly devoured. When Fire came to the tree, she lifted her branches high, and though it licked at her bark, she was full of strength and water, and would only smoke and not be consumed. Fire broke against her and slunk away to find an easier meal." She did not smile as she told the story, and fell silent when the story ended, as though to give the pup a chance to consider its meaning. As the adult spoke, she heard the story and it did not take her long to figure out the meaning. She couldn't think of anything to say. The adult had noticed her fear of fire. Of the flame that brings life, but thought of as death. "Thank you, Wise Wolf." [Aphrodite spoke sincerely and without lie. She had quickly changed her eyes to grey again, to hide her glowing fear. Another wolf stepped into the pack, it was, in fact, her favorite wolf. Audric, as she recalled. The Terra Lupus. She smiled bright and walked over to him, sitting down right in front of his paws and cocking her head like a little angel. Audrics ears perked as Kamea asked if anyone else was experiencing problems. "I am lady, the trees are not speaking like the normally do." He spoke swiftly still slightly uncomfortable with his surroundings. Though through this process he did not notice the pups had semi broken from each other and one, the possible new member to his group, had come to join him. he gave a rare smile to the small female and laid a light paw on her head, removing it before it became a burden. "And how are you doing?" Entering way after the others, to the margins, Quill had taken his time and was looking at the things around him for clues as to what was happening around here. Rain had started to fall from the dark clouds. His pelt did not drench from the rain that fell upon him as it was conjured from his mind. His ears flicked and eyes upon the wolves ahead of him. Quill finally caught up to see that Blaze was taunting the pups once more. He moved forth and sat along side Kamea and Misae. The weather saying everything about his mood at that moment. His tail curled obediently to his side as he looked at the wolves around, then to Kamea thinking 'Whats going on here Kam?' his ears flattened, the question was rhetorical, he already knew that Kamea didn't know. He had never smelled such a stench, nor seen Kamea affected the way she was. When it became apparent that Quill had returned, the fiery female cast a lingering glance at him. His presence made her wary, so she backed away from the pups, but made a not to keep an eye on the one who introduced himself as Marco. There was another to arrive, and that was about all that Blaze could take. With a steadfast frown, the female walked away. Halting, the female looked behind her. Yes, there were patches of burn grass, but why did she feel so cold? Blaze looked around, and then the rain fell. When her fur was plastered to her hot body, and her flames still burned, she found that her question had been answered. Water was not going to kill her, even if it scared her a teeny tiny bit. Releasing the breath that she had not taken notice of holding in a frustrated manner, the White Lighter stomped off to an area where the rain did not fall. "Curse Mr. Perfect and his stupid mood swings and his stupid rain and this stupid thing that has them all so scared," she grumbled as she sat in the only dry area she could find. 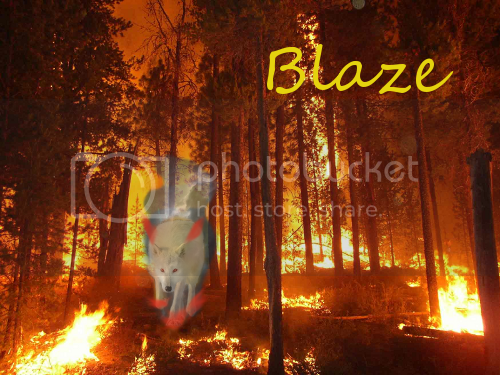 Blaze was not one to stick around and socialize, even for stories that may have been remotely interesting. She knew that deep down, if she lost control, the results could be devastating. Sighing in a lonely fashion, Blaze kept a careful watch on the others. Her ruby eyes were dull and empty of the lively emotions that danced like flames behind them as she shivered in cold, and she hoped that she had gone far enough away for others to not have seen what was going on. She did not have the answers and would not be fooled into looking like the fool when the others shared their knowledge.